Designer Omer Sagiv’s futuristic Solar Powered Vehicle (SPV) is an ideal vehicle for long rides in deserts or other open lands. 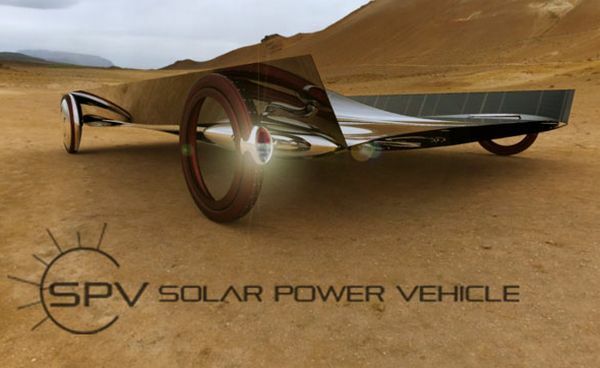 The SPV is a typical solar vehicle design. The aluminum structure mounts plenty of flexible thin film modules, which can generate much energy for long rides. In form, the SPV almost resembles Nuon solar car, developed by Delft University. The solar vehicle features a shaft in the middle, which acts as an integrated cooling system as well. The shaft rocks an aerodynamic form and the entire design of the vehicle complies with it, helping it move faster in open areas. The entire surface of SPV seems to be covered with thin film solar modules to harvest maximum solar energy even on the move. The SPV comes with not only a solar option to charge. There is also an option to charge the electric car from home power outlets. Being a plus, extra energy can be collected from sunlight on the move. The SPV enjoys an attractive look and, of course, thanks to its aluminum body, it is glossier. Sagiv has surfaced this solar powered vehicle design as an eco friendly option for riding. In future, some manufactures may bring it into reality. Construction of the vehicle may not be much expensive, however. Designers have come with many bizarre concepts for green cars these days. Eco friendly vehicles are gaining reputation among customers also, since the world witnessed energy crisis and also saw fuel price mount up. Indeed, solar energy is one of key sources for power in electric vehicles.